Solange studied a Bachelors in Mathematics and Aerospace Engineering at University of New South Wales. Solange founded Cuberider, a leader in innovative STEM education, which brings access to space down into the classroom. Solange has lead Cuberider to be the first Australian payload to ever go to the International Space Station and inspired thousands of students across Australia. I will start with where I am now and what I am becoming known for, my start up Cuberider which began about two years ago. What we are doing is trying to get young Australians, particularly those in high school, excited about all the opportunities that science, technology, engineering, and maths (STEM) have to offer. We have tried to reinvent what the classroom looks like for high school students, instead of just going to science class, you go to ‘mission control’ and instead of reading information out of a textbook, you go on this great journey over a school term built through all these hands-on activities and group work. The outcome of that term is then sending code that you have written yourself that manipulates sensors on a piece of hardware that you are using in the classroom, manipulating those sensors in a way that is ideally going to allow you to test some kind of hypothesis. We provide each class room with a piece of hardware which we have developed with some pretty ordinary sensors on it such as UV radiation, cameras, thermometers, and the usual things you would see on a data logging piece of equipment. This is then all piped into an ordinary micro controller. We have gotten the combination of the hardware and the microcontroller NASA approved, with each piece of hardware being a replica of what we have on the international space station. We then take that information that students have produced and we send their information to the International Space Station, we take the bits of coding produced by thousands of students loaded onto a singular piece of hardware via a rocket. The information can be saved on the actual hardware and launched into space or it can be uploaded digitally, the students can then see the results that their coding has produced. The link to that real-life space mission then makes the whole experience exciting for the students. One of the hardest parts of our job is the coordination side of things, we take care of organising the rockets and the sending of information. It takes a bit longer to arrange as we are the only Australians involved with the International Space Station, meaning that there are a few more hoops for us to jump through in order to be part of the NASA payload, as we are not able to do it as an Australian company as an Australia payload. We have been able to bring the period down to around 6 months, it then takes about a similar period to get through the legal paperwork with the Australian government. The program comes under so many different laws, they are quite strict and since the age that people started launching bombs into space, strict space and security laws have existed. The fact that it is challenging to do though only adds to the excitement when it does eventuate. So far, we have a track record of being able to get students more enthusiastic about coding, technology, and science in general. Removing the ‘nerdy’ or ‘geeky’ stereotype and showing them that in fact all the cool things that they enjoy in their daily lives actually comes from STEM. The whole model is around replicating industry as much as we can within the school curriculum, instead of doing individual work they are working in teams. They are not learning to code just because people say that it is a valuable skill to have, they are coding in order to create a tool which in turn actually does something, it has a purpose beyond learning. It requires the students to use data science, which I think is a first for many of the teachers as well. It is using real technology that is not perfect, it requires a certain level of savviness around it. Every time students overcome a challenge for the first time, you see them go through that ‘lightbulb’ moment, that very reason that all of us young people are in STEM. At the end of the year we get to speak to all of the kids, we invite them to talk about their experience. This is where all of the ‘warm-fuzzies’ come in, where you get to hear them talk about how we have changed their lives or how it has been the most exciting thing that they have ever done. You would be surprised by some of the comments that we receive back. It makes me reflect on how I got into operating within the STEM space and working with rockets and space myself. I guess I was always a bit of an odd-ball student, I had a non-standard upbringing. I grew up in the Northern Rivers of NSW on a property which was off the grid, we had a rainforest and eucalyptus farm only some 50kms out of Grafton. We didn’t have power, running water, post or the other services that town people tend to take for granted, we were truly living off the grid. Droughts were always a challenge as we only had a water tank to live off and we didn’t have neighbours. The night sky naturally inspired me, I got my first telescope at the age of 8 and from then I was convinced that I was going to be an astrophysicist even though I had no idea what that actually meant. I must have just heard the term on an SBS documentary or something. By the time I got to high school I realised that engineering was going to be the best fit for me, I loved using power tools and I had always been a Lego kid. I enjoyed making and breaking things, fixing and improving them. Even now I am still a flat-pack queen, I get a lot of satisfaction out of doing these sorts of things. I then went on to do aerospace engineering at uni, I interned at a start-up company where I definitely got the bug. I started becoming aware of the STEM crisis that Australia is currently facing, from the employer’s perspective there is not enough supply to meet the demand for these types of technical roles. Less and less students are going through uni or TAFE and engaging in the STEM subjects. For me it was learning about space that got me through class and kept me in high school, so I thought if it inspired me then why couldn’t we use it to inspire the rest of the youth of Australia. Its intrinsic, humans have always looked to the stars for inspiration so then it is just a matter of putting that into a more palatable format for the 21st century. We started the way that all great start-ups do, we went to our old high school teachers with our idea. Our old teachers were like our early investors, I was not able to convey my ideas clearly enough for anybody to be willing to invest in us. My early pitches were cringe worthy. Before we even built a product, we went out and got 30 schools signed up and paid for as proof of demand and of genuine interest but also out of necessity. It was then a matter of working as hard as we could in order to deliver what we had promised. We then went through a 6-month accelerator program which took us out of our engineering and science bubble into a business mind frame. We ended up catering for almost 60 schools in our first mission which took place last year, in was an Australian first and very exciting. We now have an office, a team of 10 and are in the next stage of being a business, something beyond just being a start-up. We are now at the growing phase as opposed to the trial and error phase. Whilst there have definitely been teething issues, the period of growth is exciting. I feel like I am now getting into the meat of having a business, it isn’t as good to talk to people about as you aren’t doing 10 things everyday where you have no idea as to how they will turn out but it is all the same an exciting part of the journey as an entrepreneur. I have received lots of great advice over the years. One of the things that I heard constantly which I think is important to echo is to never say no and to take every opportunity that comes your way. Even through the random meetings or events that I have attended, I have met the most amazing people and have come across some incredible opportunities as a result. One of the favourite pieces of advice that I have heard, although I am not sure of its origins, is that ‘an ordinary person can learn from their mistakes but the truly intelligent can learn from the mistakes of others’. Going through the accelerated mentorship program, one of the most valuable parts are the mentors that you have access to. This piece of advice stuck with me the whole way through, I didn’t just listen to the mentors who were successful, I also listened to those who had failures and I was then able to learn from this. I think in turn that I have been able to avoid many mistakes because of hearing the stories of those who have made them before me. My favourite quote is by Margaret Mead ‘never doubt that a small group of thoughtful, committed citizens can change the world; indeed it’s the only thing that ever had’. This quote is always the last slide of every presentation that I give. I think this is so true for a start-up, just because we are small and there are only a few of us, doesn’t mean we can’t have a big impact. I think we were able to have a big impact when we were only a team of one and two, now that we are a team of 10 we can maximise the impact. It is all about not underestimating what you can do and not adopting the mentality of ‘it’s not going to make an impact’. I am certainly not someone who gets up early, I need my 8 hours and I don’t get up at 5am. I don’t have any extreme habits. I am however extremely organised, I have an internal calendar in my mind and I have always had strong time management skills. Our whole company is run on Trello because I have always used Trello in my personal life which I have naturally found really works for me, I have a million-different notetaking aps on my phones. It allows me to increase my output and the amount of work that I can do. One of my other habits is consistency, I am not someone that moves in and out of phases. I won’t diet, start exercise fads, cut-out coffee or do dry July, I am pretty consistent across the board. I eat what I want to eat, I drink as much coffee as a I want and I consume as much wine as I want. I guess it’s a carryover from the say yes approach to life, having that moderation allows you to focus on the more important things. I am a recent convert to audio books but I am yet to master them, I find that it can be hard to listen to every single word when you are used to having background noise. 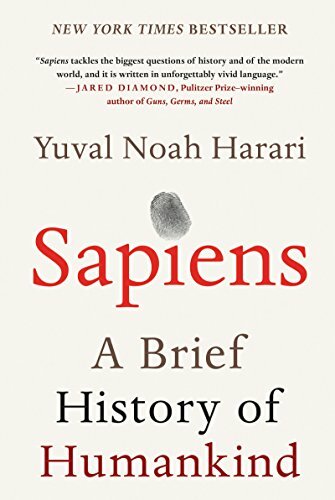 I did recently listen to Sapiens by Yuval Noah Harari, which I loved. Before listening to it, I did not realise how ignorant I was regarding human history. It provides a great insight into our behaviour, it goes through the different periods of human development. It looks at the pros and cons of the different periods, where often we only hear about the pros and how it has led to the way in which we know humanity to exist today. Hearing some of the negative aspects provides a different perspective. I am currently reading a book about effective altruism which I love. It is written by a younger author, William MacAskill, who is this cool young guy, there is no fluff. There is none of the usual glamour and glitz used in marketing, it really comes down to crunching the numbers in order to work out the best ways in which to donate money. It exposes the way in which we have fooled ourselves into thinking that certain things we do have a high impact, it is almost as though we have placebo effected ourselves. I think it is then important that we realise this and undo this way of thinking so that we can start doing some more good. If you jump on our website www.cuberider.com/ your emails will come through directly to me at some point. You can email me about anything whether it is about education, space or about contributing to our program in some way. We do have a rocket launch happening in early August so I won’t be quite so available. We will be live streaming our launch events which people can watch online.